This wasn't going to be a full on explanation of why we have been a bit absent on here but I thought it needed to be said because we are so so thankful to everyone who has been with us from the beginning and to those who are joining later in the game and felt it only right to let you know a bit about what happened to us. I also wanted to take this time to big up my better half Jo who has been pretty much single-handedly running our Instagram and keeping the dream alive. Without her this little venture would have died a quick death but she has managed to work her full-time job, keep up her insane (to me insane) exercise regime, plan and execute the best wedding, get pregnant (while still managing to exercise), bake, AND do her nails and post about them regularly enough to keep us going. So I want to say the biggest thank you to her for not only keeping up with this but for being an overall life inspiration. She is a super woman! Anyway, onto the nails. What better way to ring in the autumn than with some lovely little florals. Having been so out of practise this was a relatively simple design to get me back into it. I think the original design for this came from @ninanailedit but I saw them in our feed when @liinslus recreated them. 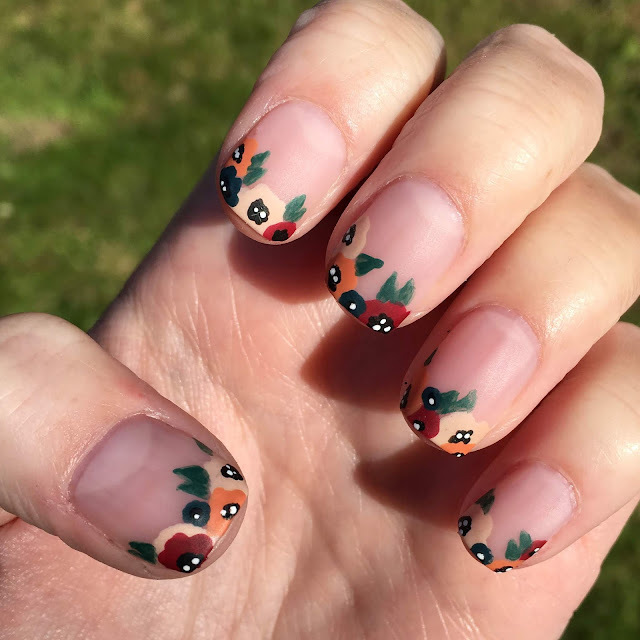 I changed the colours so that they were more autumnal. 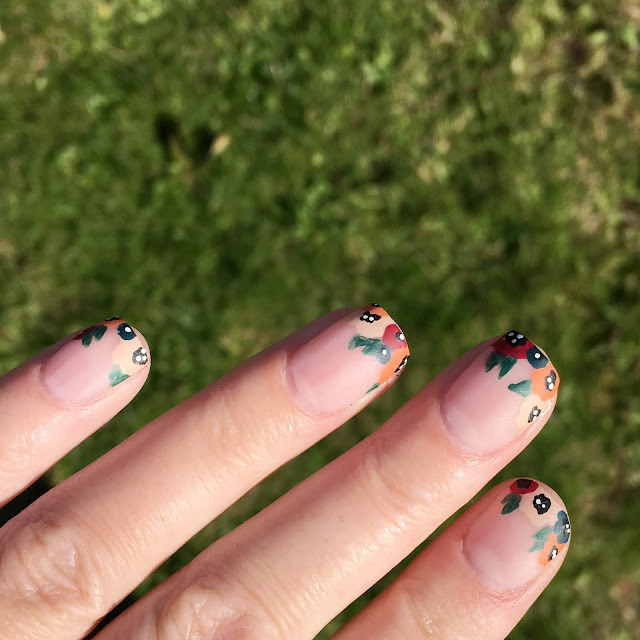 To create this look I used Essie's 'Sugar Daddy' for the base and a range of OPI's Washington DC collection (2016 I think) including: Freedom of Peach, Stay Off The Lawn! !, Pale to the Chief, We the Female. To draw the flowers I just used a dotting tool, I used a brush for the leaves and the black and white are my trusty Barry M nail pens that I had to order from Amazon as they have been discontinued. So there you have it, my first foray back into nail art after a looooooong hiatus. I find it so therapeutic though, it took me to my happy place! Expect to see more from us (well, me), in the future!